Less than 24 hours ago, Ford teased a new ST performance variant of... something. Was a new Fiesta ST coming to the Detroit Auto Show? Maybe an F-150 ST in the spirit of the old Lightning? No, it turns out Ford is doing an Edge ST in an attempt to make crossovers interesting which, I mean, good for them. So far all we know about the Edge ST is that, yes, it’s really going to be real, and apparently will feature a suspension upgrade, a “Sport Mode,” an eight-speed automatic transmission, all-wheel drive and a 2.7-liter EcoBoost V6 engine rated at 335 horsepower and 380 lb-ft of torque. For those of you who might have forgotten about the Edge, I’ll forgive you. And remind you that the Ford Edge is a five-passenger four-door fat hatchback with a decent amount of ground clearance and cargo space. You know, like every other crossover. 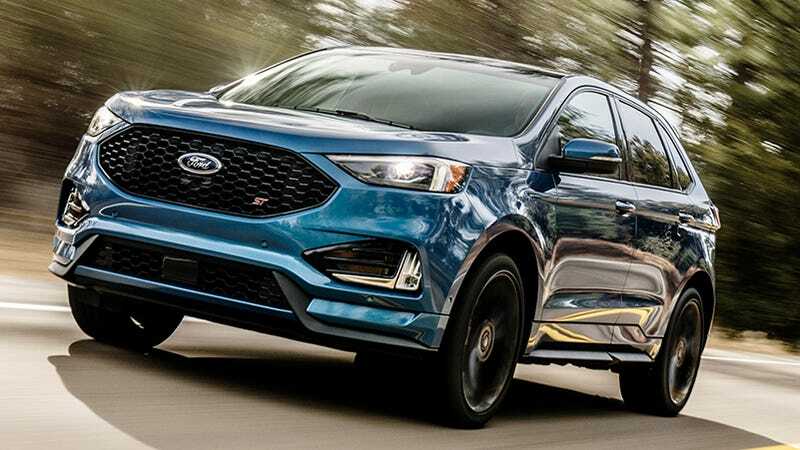 The Edge Sport was previously the closest thing to a fast version, and actually it probably does move well with its own 2.7-liter EcoBoost engine, rated to 315 HP and 350 lb-ft of torque on 93 octane gasoline in Sport guise. So, an extra 20 HP and 30 lb-ft is a decent bump in output. And if the unique transmission really is good, the crossover could actually be pretty fun to flog. Steering wheel-mounted paddle shifters will let you manually move the Edge ST through its gears, while ST-specific 21-inch wheels and some body accents, plus a little red ST badge in the big gaping grille, will let everyone else in your complex parking area know what a dangerous beast you are. A 2018 Edge Sport costs about $40,000. Pricing has not yet been confirmed for the 2019 ST, but I would expect it to be at least a few grand above the Sport’s MSRP. We’ll undoubtedly learn more in Detroit as the 2018 North American International Auto Show goes down next week. Now, the pragmatist in me wants to know “who on Earth is this for?” But the enthusiast in me is just excited for something different. We’ve had performance crossovers before; the Mercedes-AMG GLA and BMW X6M would fall firmly into that category in my opinion. But I have to admit, I had no idea an Edge ST was even on a whiteboard somewhere let alone in the pipeline for production. And for that reason alone I think this is kind of cool. Hopefully Ford fits the right head gaskets on it.